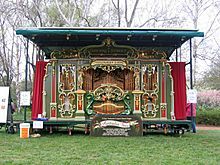 The "Australia Fair Grand Concert Street Organ", which automatically plays "Advance Australia Fair"
"Advance Australia Fair" was composed in the late 19th century by Peter Dodds McCormick under the pen-name "Amicus" (which means "friend" in Latin). It was first performed by Andrew Fairfax at a Highland Society function in Sydney on 30 November 1878. The song quickly gained popularity and an amended version was sung by a choir of around 10,000 at the inauguration of the Commonwealth of Australia on 1 January 1901. In 1907 the Australian Government awarded McCormick £100 for his composition. Before its adoption as Australia's national anthem, "Advance Australia Fair" had considerable use elsewhere. For example, Australia's national broadcaster, the Australian Broadcasting Commission, used it to announce its news bulletins until 1952. It was also frequently played at the start or end of official functions. Towards the end of World War II it was one of three songs played in certain picture theatres, along with "God Save the King" and the American national anthem. In 1951 there was a competition for a new national anthem to celebrate the golden jubilee of the Federation of Australia. The entry by the Austrian-born conductor Henry Krips, "This Land of Mine", won the competition but it was decided to make no change to the status quo. Until 1974 "God Save the Queen" was Australia's national anthem. In 1973 the Whitlam government decided that the country needed an anthem that could represent Australia with "distinction" and started a competition to find one. The Australia Council for the Arts organised the contest, which was dubbed the "Australian National Anthem Quest". The contest was held in two stages, the first seeking lyrics and the second music, each having an A$5,000 prize for the winning entry. On the recommendation of the Council for the Arts, none of the new entries were felt worthy enough, so the contest ended with the suggestions for "Advance Australia Fair", "Waltzing Matilda" and "Song of Australia". The wordless orchestral version of "Advance Australia Fair" that is now regularly played for Australian victories at international sporting medal ceremonies, and at the openings of major domestic sporting, cultural and community events, is by Tommy Tycho, an immigrant from Hungary. It was first commissioned by ABC Records in 1984 and then televised by Channel 10 in 1986 in their Australia Day Broadcast, featuring Julie Anthony as the soloist. Both the lyrics and melody of the official anthem have been criticised in some quarters as being dull and unendearing to the Australian people. A National Party senator, Sandy Macdonald, said in 2001 that "Advance Australia Fair" is so boring that the nation risks singing itself to sleep, with boring music and words impossible to understand. A parliamentary colleague, Peter Slipper, said that Australia should consider another anthem. Specific criticism is also directed at the fourth line of lyrics, "our home is girt by sea", for its use of the archaic word "girt" to acknowledge the fact that Australia is an island. The current version of the anthem has a mix of old and new language, rather than having one style of language consistently throughout. Criticism has come from various people, including Australian Labor Party politician Craig Emerson, but others, including former Labor leader Kim Beazley, have defended it. Advance Australia Fair Facts for Kids. Kiddle Encyclopedia.